The variety of manufacturers, types and styles of equipment may make the purchase of air conditioning a little daunting. It is crucial to have an experienced and accredited installer on hand from the start. At Constant Cooling Ltd our many years of experience ideally place us to make the correct recommendations that will fit within your budget to ensure that your environment is to the comfort you desire. Today's high-tech office environments can pose difficult solutions for the ever important environmental question. A majority of buildings have heating systems but few provide total comfort control. The innovative design of a modern building which maximises the natural light through increased glazing, but causes increased variation in the thermal load depending on the time of day and the number of people in the office or machinery in the vicinity. Increased standards of insulation mean more heat is retained. The desire to reduce energy bills. Create a more comfortable climate. We can provide you with a complete solution from the initial site survey through to design, project management and final commissioning. Our engineers are all fully trained and work to the highest standards guaranteeing you a first class installation service. 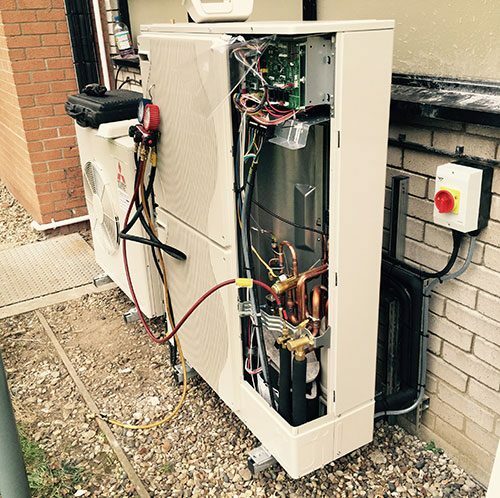 Whether it is just a simple installation of a single Air Conditioning unit or a full commercial installation, we can provide you with one point of contact ensuring that your project is delivered on time and within your requirements.